Want to enjoy your favorite music, podcasts, or audiobooks while you drive? The answer is to hook your phone up to your car. But what is the best way to do this? We’ll show you all the different methods, like Bluetooth and USB, that will let you connect your Android phone to your car audio. Most of us enjoy music while we’re driving, but often the radio doesn’t play the tunes that get you rocking. While CDs are a good choice, they scratch easily and you have to swap them often. 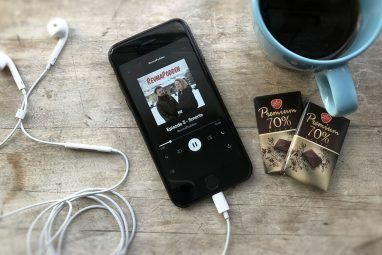 Fortunately, a smartphone with storage space for MP3s, and online connectivity for streaming is a good alternative. As long as you have a safe place to mount or place your phone (our list of the best car phone holders The Best Car Phone Holders to Mount Your Android or iPhone The Best Car Phone Holders to Mount Your Android or iPhone A car phone holder lets you keep your phone in view while driving, providing you easy access to GPS, music, and more. Here are the car mounts you should buy. Read More should help) and the necessary range (or cable) to send a signal to your in-car audio system, you can use an Android phone for your audio entertainment while driving. After all, if you’re going to use Android to monitor car performance How To Monitor Your Car's Performance With Android How To Monitor Your Car's Performance With Android Monitoring tons of information about your car is incredibly easy and cheap with your Android device -- learn about it here! Read More and navigate with GPS apps The 8 Best Free Offline GPS Apps for Android to Navigate Anywhere The 8 Best Free Offline GPS Apps for Android to Navigate Anywhere Need directions on your phone but don't have an internet connection? These offline GPS apps for Android will help you navigate. Read More , then it makes sense to rely on your phone for music in the car too. PSA: Don’t Use Your Phone When Driving! Although we’re discussing the use of a smartphone while driving, it is important to understand just what this means. While you’re not making calls or texting, the device is still running. As such, taking your hand off the wheel and eyes off the road to change track, find a new radio station, switch audiobook chapter, or load a new podcast is dangerous. It’s even illegal in many areas, just like taking a call or texting. You should not do anything that distracts you from actually driving. Rely on one of the passengers (preferably one in front). Use steering wheel mounted controls, if available. Find a safe place to pull over (bearing in mind the importance of being able to pull away safely later) and make the changes. For the safest experience, however, just leave the music alone until it’s time to stop. If worst comes to worst, you could switch to broadcast radio. The most obvious solution is to use an analog cable (like this model from StarTech) connecting the 3.5mm headphone jack on your phone to the line-in port (or aux port) on your car’s audio system. They’re easy to find offline or on Amazon, and simple to connect. For instance, you might have a standard line-in connector mounted on the front of your car audio system (or elsewhere on the center console), providing easy access. Alternatively, you may need to run the cable into the dashboard in order to hook up your phone. Older audio systems with a cassette tape player allow you to use a cassette adapter. This is a small, low-cost device that connects to the headphone jack on your phone and allows you to play music into the car audio system. Many modern car audio systems have Bluetooth as an option for playing music across a short-range wireless network. In order to take advantage of this, begin by activating Bluetooth on the car audio system, making sure that it is discoverable. You’ll need to check your automobile’s handbook to find how to do this. On your Android device, open Settings > Device Connection > Bluetooth and set to On. (You can also find your way here by pulling down the notification shade and long-pressing the Bluetooth button.) Wait for the screen to update and display your car audio system, then select it to pair. Once done, your phone should automatically pair with the car in future. For the best results, your phone should have Bluetooth 4.0 BLE to reduce the impact on battery life. However, even on long journeys (especially if you’re also using Google Maps Google Maps on Android: Everything You Need to Know Google Maps on Android: Everything You Need to Know Does Google Maps on your Android device feel a bit daunting? We've got you covered. Here's everything you need to know about using Google Maps on Android. Read More or some other GPS app), you should keep your phone charged while driving. Like Bluetooth, some modern car stereos have a USB port that you can use to connect external storage devices. This enables you to then browse your library of tunes through the car audio system. Hooking up an Android phone this way is simple. If a USB cable came with the audio system, then simply connect your phone with a suitable adapter. Otherwise, identify the USB port on the unit and connect your Android device. Once connected, your Android phone will need switched to storage mode. 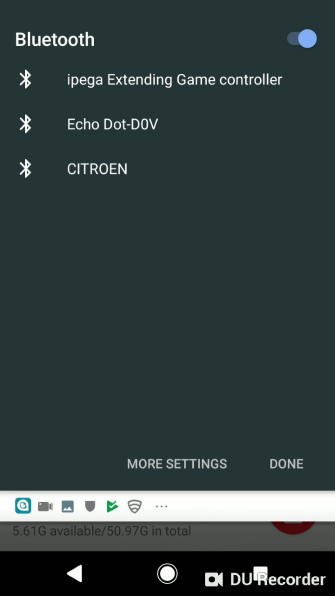 Drag down the notification bar and tap Charging this device via USB. Switch the Use USB for option to File transfer (differs according to Android version and manufacturer). You will then be able to navigate your Android phone’s library on your car audio system. The type of USB your phone has will determine what audio files you can listen to. The standard data/power cable for Android devices, this should enable you to connect your phone to your car and enjoy your MP3 collection. However, that’s it. This option is no good if you’re planning to stream music from Last.fm, Spotify, or Pandora, as it is purely for playing back MP3s stored on your device. With USB-C, there’s a good chance that the connection will support audio (some earlier examples of the connection do not, however). As such, you may be able to connect your USB-C cable from your phone to the USB port on your car’s entertainment system and enjoy streamed audio as well as MP3 data files. You’ll find the right USB-C cable on Amazon. If Bluetooth isn’t an option for you, consider an FM transmitter. This is a device that connects to your phone and broadcasts (over a very short distance) to your car stereo. Switching to the FM band on the radio should then let you wirelessly enjoy the audio playing on your phone. 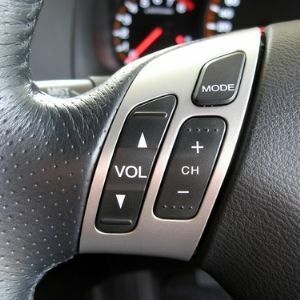 Some FM transmitters connect to your phone’s headphone jack, while others rely on your phone’s Bluetooth connection, essentially giving your car radio Bluetooth capability. Either way, most require constant power from your car’s charger. Smartphone design differs considerably between manufacturers. As such, you should take the time to find a unit that works well with your device. We’ve covered the best Bluetooth car adapters The 4 Best Bluetooth Car Adapters to Connect Your Smartphone The 4 Best Bluetooth Car Adapters to Connect Your Smartphone Looking to connect your phone to your car? Here are the best Bluetooth car adapters, aux adapters, and more. Read More worth a look. What About an FM Transmitter App? You might be tempted to try the FM transmitter approach using an app Do FM Transmitter Apps Work? How to Transmit Radio From Your Phone Do FM Transmitter Apps Work? How to Transmit Radio From Your Phone Do FM transmitter apps work? And how else can you broadcast radio from your phone? Here's what you need to know. Read More . However, we would strongly recommend against this. 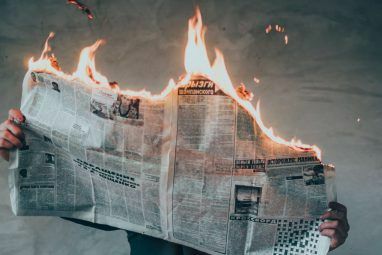 Our research reveals that such apps are almost always adware, and Android devices don’t ship with the necessary hardware to broadcast on the FM band. Indeed, apps listed as “FM transmitters” on Google Play are very poorly rated, a situation that doesn’t change until legitimate streaming apps (with no transmission feature) begin to appear in the search results. In short, FM transmitter apps are at best a waste of time, and at worst scams Scam Apps in the Play Store You Need to Avoid Scam Apps in the Play Store You Need to Avoid For every amazing app you can find on Android, there's a cheap knockoff waiting to waste your time and steal your money. Read More . With the wealth of ways for playing music in your car from an Android device, more and more people are opting for Bluetooth or FM transmitters. But you also have the option of USB cables and 3.5mm audio cables, just in case. This last option also includes the increasingly rare cassette tape adapter. Until all cars ship with Android Auto as standard, these are your best options (don’t forget you can use Android Auto now). Wirelessly connecting your phone to your car is easy and convenient. In fact, the only real problem is that you have two volume control options to keep track of. Explore more about: Android Auto, Automotive Technology, Streaming Music. 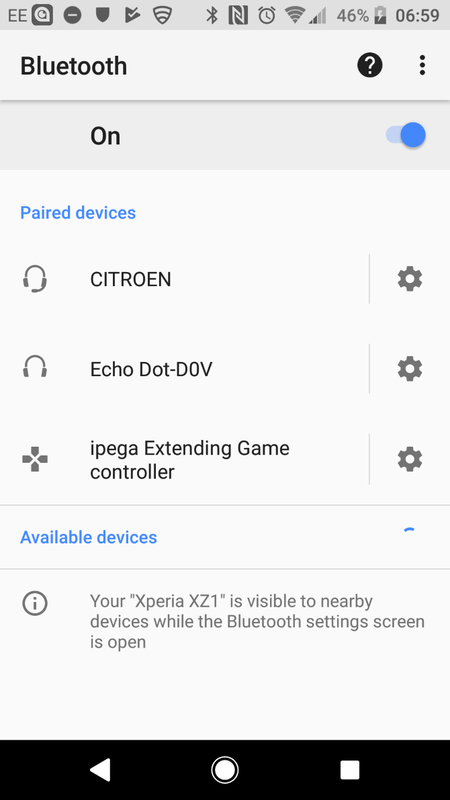 Toyota's Etunes infotainment system is easy to use and so you can easily connect your Android phone via bluetooth, USB or AUX.